Week ending 18th January 2019. Boy, what a week we have had! Who says politics is boring? Obviously Brexit has taken centre stage, but rather than regurgitate the news flow, it is important to put everything that has happened in context. The results of both the votes in Westminster (the EU Withdrawal Bill and the vote of no confidence in the UK Government) were entirely predictable – and as such, there were no great moves in either the pound or the UK equity market. However, the results do make the chances of a no-deal Brexit much slimmer. At the risk of being repetitive, as I highlighted six weeks ago (please see here), given that the majority of MPs are opposed to a no-deal Brexit, it is increasingly likely that we will have an even softer Brexit than that proposed by Theresa May, or no Brexit at all. Nevertheless, what we have learnt this week is that it is now almost inevitable that Article 50 will need to be extended and our exit at the end of March will be delayed to allow time for MPs to reach a consensus. 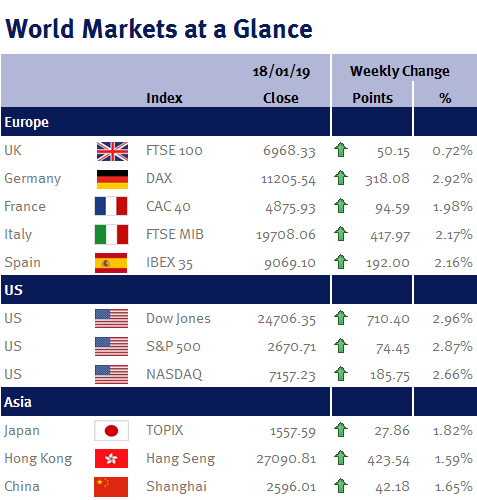 Despite all the drama in the UK, it has also been an important week internationally with several insightful Fed speeches. Neel Kashkari, the Minneapolis Fed President said he currently sees no evidence to support further US interest rate increases and stated that he would like to see wages strengthen and inflation pick up before raising interest rates any further. The Kansas City Fed President, Esther George stated that a pause in interest rates would give the Fed time to assess if the increases to-date are having the expected responses on the US economy. Consequently, I would not be surprised if this is now the top of the US interest rate cycle. And even if the Fed does raise US interest rates once or twice more, it is very clear that this tightening cycle is very close to the end – making this one of the loosest tightening cycles ever. And a pause or slowing in the US tightening cycle should be positive for equity markets as concerns have recently increased that the Fed could over-tighten and tip the US economy into a recession. Additionally this week, optimism grew over the potential for a new trade deal between the US and China. China reportedly offered to increase imports from the US in order to eliminate the current trade surplus by 2024, while Steven Mnuchin the US Treasury Secretary has reportedly discussed lifting some or all tariffs that have recently been imposed on Chinese imports. If I could sum up this week in a nutshell, it is that while the news coverage makes us (as I am sure it does you) feel uneasy, we remain focused on the long-term fundamentals which remain positive: the global economy continues to grow while inflation remains under control – a goldilocks scenario. And as I have written before, and it is particularly apt to repeat this week: it is never wise to trade news headlines! This week coming, members of the World Economic Forum descend on Davos, Switzerland for their annual conference. Additionally we have ECB and BoJ monetary policy meetings; Chinese GDP, retail sales and industrial production; and UK employment data (unemployment rate and weekly earnings).